and looking forward to a happy new year with all the Terroristas. Photo by Warren. Click to enlarge. Here's the rest of it. See how much you can figure out while you're still sober. I wish I could upload a smell. Our house smells like simmering beef, blanched bacon, onion, garlic, thyme, red wine, tomato paste, black pepper, bay leaf, and carrots, all nicely browned and deglazed and tossed together in a big granite pan and luxuriating in the oven at 325 for the next three or four hours, to be introduced to a pound of mushrooms sauteed in butter, and tiny red potatoes tossed in a butter and parsley sauce and served with a glass of red wine and a baby green salad with balsamic vinegar and olive oil. Oh, and did I forget to mention a loaf of freshly baked bread? I'm going to take a nap now and just BREATHE. There's an old saying, "If you were born to hang, you'll never drown." Looks like Tim, the Rogue Hanger, was born to hang . . . drywall. If you like to hear highly competent people talk about doing the things they love, you might enjoy Tim's series on drywall. And Tim need never fear the water. In a post dated the 29th, Acidman referred to a website called Citizens Against the Troops, which included particularly sadistic sentiments. When I tried to follow the link, however, I found that the URL had been purchased by the New England Police Network, which has a message about the original owner:"a well known nut named Michael Crook" who also put up websites called "forsakethefirefighters. info" and "forsakethepolice.org", which NEPN also bought out. Crook appears to be a mentally disturbed person, and the NEPN has done a public service by taking him off the internet. Once chihuahuas taste manflesh, there's no stopping them. Farris’s move was certainly naïve and idiotic but I can’t but admire his spirit. 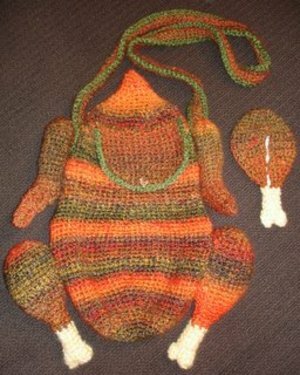 It's a knitting project from Craftster.org, via Fawn Jotters. Fawn Jotters, written by a gentleman from Aberdeen (so I daresay his first name isn't really Fawn) is one of the most original and interesting blogs on the 'net. The posts are mainly short and gadget oriented, but FJ finds things no one else does and has a pleasantly ironic style.